Big news lately is the disappearance of Saudi Arabian Washington Post journalist Jamal Khashoggi, who entered the Saudi embassy in Turkey and never came out, or at least, in one piece, apparently. Turkish authorities are now blaming Saudi Arabia of sending a government hit squad to the embassy to kill Khashoggi, who has been very critical of the Saudi royal family. 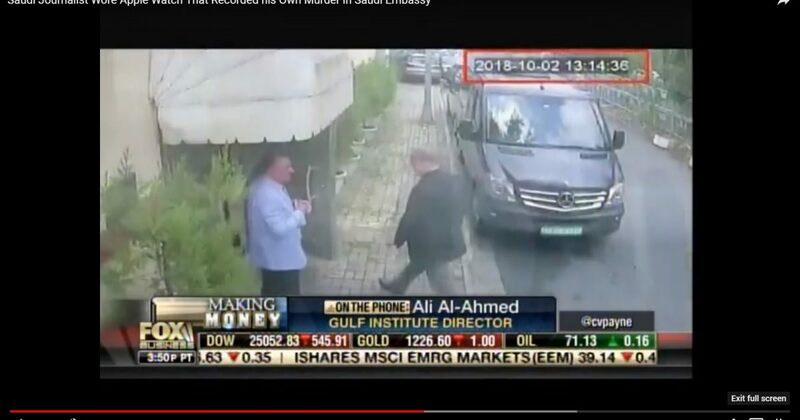 Director of Gulf Institute Ali al-Ahmed was interviewed by Fox News’ Charles Payne and is claiming that Khashoggi was wearing an Apple watch that recorded his death, the audio of which was sent to his iPhone and is now in the hands of Turkish authorities. In addition to the audio, Ahmed is claiming that the watch also recorded the exact time and place of the murder as well as the current location of the body, or at least the arm the watch was on. Ali Al-Ahmed: What we know so far is that the Turkish government has proof that Khashoggi is dead. And, they at least have audio of the incident. In my opinion, it was recorded to his Apple Watch that he was wearing according to his iPhone. Charles Payne: Hold on one second, Ali, let’s go over that real slow because that’s a shocker. Somehow, he was able to enable his iPhone watch to record his own death at the hands of Saudi agents? Ahmed: Yes, sir. And, the Apple Watch not only recorded the event but also gave the specific time and the location of the body because they forgot to take it off. They were unfamiliar, it looks like. Payne: This is absolutely explosive!